LIVE ALBUM RELEASED WORLDWIDE JULY 2013. For the first time some of Australia’s most acclaimed female Indigenous singer/songwriters, BAREFOOT DIVAS, come together with their sisters from New Zealand and Papua New Guinea to release their remarkable live album WALK A MILE IN MY SHOES. Performed and recorded live at the Sydney Festival, WALK A MILE IN MY SHOES was released in Australia and New Zealand on July 16 and in the US on July 19 2013. Helpmann Award winner Ursula Yovich (Serbia/Burarra) and Black Arm Band favourite Emma Donovan (Gumbaynggirr NSW) join Whirimako Black (Maori), Maisey Rika (Maori), Merenia (Maori/Roma/Gypsy) and Ngaiire (Papua New Guinea) in a powerful symbolic musical collaboration. Performing a combination of original compositions, Aboriginal language and a fusion of English and Maori (Te Reo) lyrics showcasing the Diva’s 6 part harmonies and the remarkable voices of the troupe. Swinging between Roots, Jazz, R&B and Latin infused Soul, WALK A MILE IN MY SHOES is a unique musical creation expressing the diverse and life-affirming experiences of contemporary Indigenous women. BAREFOOT DIVAS will inspire and resonate with anyone interested in authentic, deeply-felt entertainment, contemporary song writing and musical expression. Supported by some of Australia’s most accomplished musicians:Adam Ventoura (Greek Australian) Bass and vocals, Steve Marin(Chilean) Drum set, percussion and vocals, Giorgio Rojas (Peruvian) Drum set and percussion and Marcello Maio (Greek Sicilian) Keys and Accordion, join with New Zealand Maori musician Percy RobinsonGuitar and vocals and Justin Hohua Kereama a Tohunga Taonga Puoroexpert in Maori instruments. 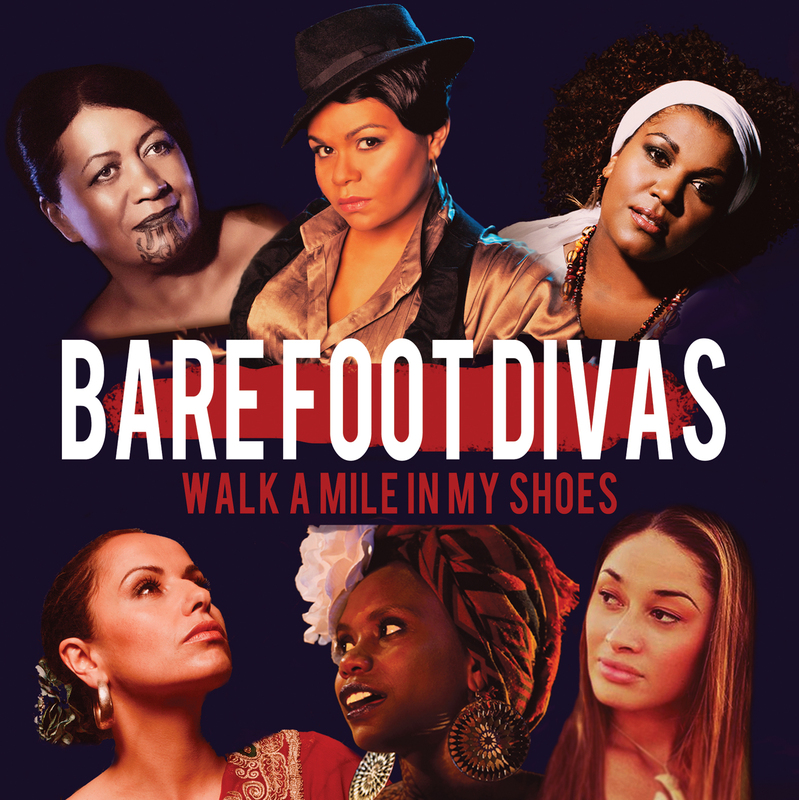 WALK A MILE IN MY SHOES was released in America as a pre promotion to the BAREFOOT DIVAS North American/Canadian tour February 2014. WALK A MILE IN MY SHOES was originally co-commissioned by Sydney Festival and the New Zealand International Arts Festival in association with Vicki Gordon Music Productions in 2012. BAREFOOT DIVAS have played sold out houses receiving standing ovations for every single performance in Australia, New Zealand, North America, Canada and China. BAREFOOT DIVAS was created & produced by New Zealand born Sydney based Manager & Producer Vicki Gordon. The stage production WALK A MILE IN MY SHOES is Written and Directed by Award winning Australian playwright Alana Valentine with Music Direction by Adam Ventoura. BAREFOOT DIVAS album is released independently on VGM and distributed worldwide through MGM Distribution. Ngaiire turns in one of the album’s strongest vocals on “Two Minds,” a neo-R&B tune that lets her show off her glistening melismatic improvisations. Midway through the song, there’s an impressive keyboard/percussion solo that suggests a West African Honky Tonk. Overall, this is well worth your time. J&R Music World.